Native American rain dances have been around for centuries, first as a ceremonial ritual to help with the growth of harvests, and now also as exhibition and commemoration of Native American history. A rain dance is one of the most famous ceremonial dances out of a long line of choreographed movement which once held the responsibility of appealing to the various Native American gods. The rain dance in particular was a way to gain favor and summon rain to come down and nourish the crops that would serve as sustenance for a specific tribe. Today, some sects throughout the world still practice rain dancing, even though they are not technically Native American tribes - notably in the Balkans. The Cherokees in the Southeast are one tribe famous for using the rain dance for rain induction and the cleansing of evil spirits. Since the crops were the livelihood of many Native Americans, the special dance seemed like a reasonable activity for those hoping to get the very best out of their harvest. 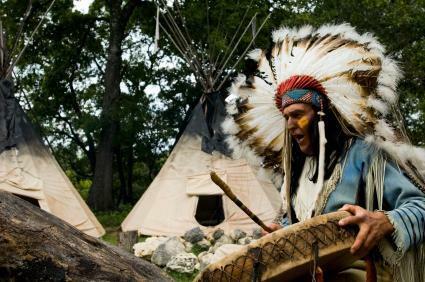 Cherokee legend dictates that the amount of rain received each year was filled with the spirits of the tribe's past chiefs, and that as the raindrops fall, these good spirits battle evil in a transitional spiritual plane. For this reason, the rain dance is considered to be religious, and many of its elaborate versions could invoke acts of uncommon, extreme worship of spirits by those specific dancers. When the Native American Relocation took place in the United States during the 19th century, many of these traditional dances that were so special to the Indians were considered to be backward and dangerous by those of the modern world. In turn, the government banned many of the Native American dances, but the rain dance was able to continue as the tribes masked it as a different dance when government officials interrogated them. In turn, depending on the region being persecuted, the rain dance covered up for other illegal dances such as the sun dance. It all became interchangeable - confusing to the outside world, but still impressively organized and reverent to the Native Americans themselves. Like many aspects of tribal life, certain elements of the earth are represented in their dances. Feathers were used to represent wind, while turquoise on their costuming was used to symbolize rain. Since rain dance traditions have been continued via an oral history, the specific traditions of each tribe's rain dance has evolved as the story has been passed down. However, the main symbols of feathers and turquoise, and the same mentality and purpose of dance has successfully continued downward. Apparently early Native Americans found success in their rain dance, as they have been credited by scientists as being some of America's earliest meteorologists. Those Indians who lived in the Midwest often knew how to follow and track various patterns of weather, and sometimes bartered with settlers of the new world - a rain dance in exchange for some modern items. Today, many elementary school children learn about rain dances by experiencing one first hand. Though far from the traditional dance meaning and environment, teachers sometimes incorporate such a Native American lesson into history class. This usually involves the listening of a traditional tribal song and then quizzing the children on what they have just heard. What instruments were used? What were the different sounds? What type of people made this sound? Next, children are invited to participate in their own rain dance, which involves dancing in a circle, playing instruments and wearing appropriate traditional symbols. While it hasn't been known to cause a torrential downpour in the suburbs, many school children are visiting an important part of our nation's history that is often forgotten. Through them, as well as the remaining tribes and professional preservation groups that exist today, Native American rain dances and other traditions of movement continue to endure and be shared with new generations.